It was Andrew Carnegie, a man who made his money in steel, who fell in love with Louise Whitfield, the daughter of a wealthy New York family. After getting married, Andrew decided to show his new wife his homeland. They went to Scotland to spend their honeymoon in a castle that was now owned by Andrew Carnegie. Before they docked, while still in the middle of the Atlantic Ocean, Louise introduced Carnegie to a conductor she knew, Walter Damrosch, who was also traveling on the ship. Damrosch shared the idea of a concert hall in New York, which appealed to Carnegie and after returning to New York he decided to become involved with the project. The construction of Carnegie Hall started in 1890 and miraculously finished by 1891, the same year it opened its doors. Located on 57th Street and 7th Avenue, which was unusual as the center of New York City was located near 14th Street at the time. It was a challenge for people to travel all the way there, with no subway system. However, the opening concert series was a success and lasted for five days, led by Damrosch and one of the most famous pianists of that era, Pyotr Ilyich Tchaikovsky. Click Here for the Carnegie Hall Box Office – Isaac Stern Auditorium! Today Carnegie Hall has three auditoriums -- the largest hall is Isaac Stern Auditorium, Zankel Hall and the Weill Recital Hall. Since its grand opening, the Hall has housed numerous artists and has hosted various events. One of the most important orchestras that once called Carnegie Hall home was the New York Philharmonic, who rented the Hall over 5,000 times from 1892 to 1962. Among the most famous musicians that have had the pleasure to perform at Carnegie Hall was the unforgettable Vladimir Horowitz. Horowitz would always travel with his own piano and would not perform on anything else. Before his concert, the workers would carry the piano onto the stage and he would start to play a few bars of music to test the sound. If it was not to his liking the stagehands would move the piano, a bit to the right or left. In an effort to avoid moving the piano multiple times the stagehands decided to place three nails into the wooden stage, in the exact spot where the three legs of the piano were located. The following time Horowitz came to Carnegie Hall they carried the piano onto the stage, placing it on the nails marking its previous location and waited. As per usual, Horowitz came, played the instrument and made them move the piano. After moving it a few times, miraculously the piano settled to the same spot on the stage where it originally started, the same spot that had three nails stuck into it. Later upon renovation of the Hall, as they were replacing the stage floor a piece of wood with one of the nails was saved and is now on display at Carnegie Hall in the Rose Museum. The plot twists after the death of Andrew Carnegie and the Hall was sold to a New York realtor and developer. Soon after that another threat was on its way, a new home for aspiring musicians with the construction of Lincoln Center for the Performing Arts. Since the New York Philharmonic had been paying rent at Carnegie Hall, the offer of playing for free at Lincoln Center was not one to pass up. The rent the Philharmonic paid throughout the year greatly impacted the entire revenue of the Hall; so, the owner decided to sell Carnegie Hall to a developer who planned to demolish it and build a red skyscraper. This plan came to the attention of a young violinist, Isaac Stern. He could not believe the fate that awaited Carnegie Hall, therefore he decided to take the matters into his own hands. Stern started gathering supporters, filing complaints and organized protesters. Eventually, he spoke with the Mayor of New York at the time and succeeded in persuading him that the city should buy the building before it could be sold to the developer. Stern eventually succeeded, Carnegie Hall was bought by the city of New York and was made an official National Historic Landmark. It was finally safe from any private ownership which could bring it any harm or try to change it in any way. To show appreciation and recognition, the biggest hall in the building was renamed after Isaac Stern, whose numerous portraits are to be found within the building, including the one from the famous caricaturist Al Hirschfeld, who was known for playfully hiding the name of his daughter Nina in each piece he drew. The interiors of the building are mesmerizing; from the view of the tiers, to the various rows of seating on the first floor, all the way from the back of the stage to the ones located near the front. Andrew Carnegie had his architect spend time in Europe to absorb the concept of the great European music halls. A most interesting thing, other than the vast space, are round angles which allow the sound to travel back and forth throughout the room freely. Sharp angles would distort the acoustics. Playing classical instruments in here is a complete dream come true. But Carnegie Hall is more than just classical music, it also hosts rock and pop musicians. A good example for this would be a concert by The Beatles which took place at Carnegie Hall in 1964. The demand for tickets was huge and some audience members were seated on the stage itself. There were so many people screaming it created an extremely loud volume. At that time, they were not able to sound mix over the screaming in order to enhance the vocals, which means there is no usable recording of this famous concert. Another pop star, Sting performs regularly and still rents the Hall for a fundraising concert. At one time the Hall also housed residents who were able to rent the apartment spaces above the Hall. Among the most famous tenants was Marlon Brando, who lived there at the time he won his Best Actor Academy Award for the movie On the Waterfront. Carnegie Hall has a very complex history which only makes it more valuable when recognizing its true worth. 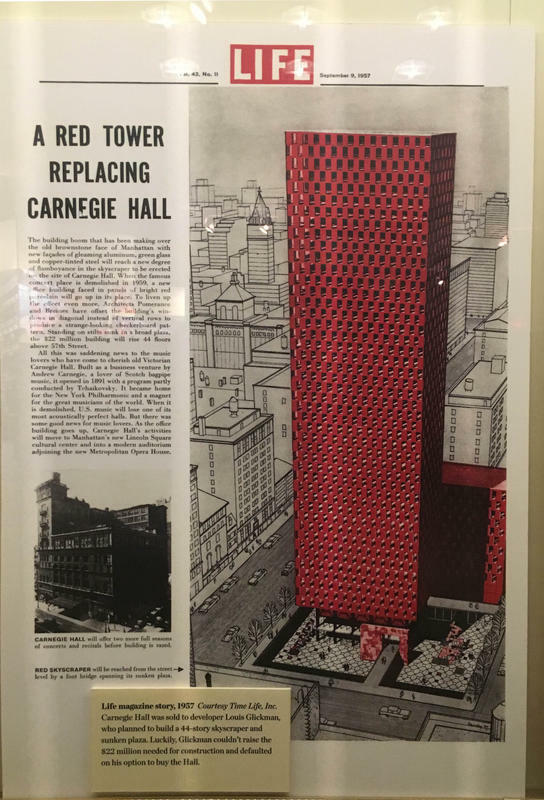 After overcoming numerous obstacles throughout its history, Carnegie Hall enjoyed a happy ending and is now safe and sound in the arms of New York City. This true love story overcame the impossible and received a happily ever after. The friendly and knowledgeable tour guides share more than 125 years of Carnegie Hall history, walking guests through the landmark building. During the 60–75 minute tour, visitors will see the famous Stern Auditorium / Perelman Stage from various points of view, walk through Composers Alley, hear the stories behind many of the famous signed photographs of performers hanging on the walls, and visit the Rose Museum, where more than 400 Carnegie Hall artifacts are on display. Click Here for More Carnegie Hall Tour Information!